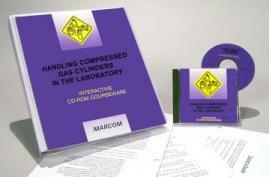 MARCOM's "Handling Compressed Gas Cylinders in the Laboratory" Interactive CD-ROM Course examines how gas cylinders "work", the hazards that are associated with them and the need for caution when using or storing a cylinder. The energy possessed by a compressed gas cylinder can make it a virtual "missile" if it is not handled with the utmost care. And a leaking cylinder or fitting can lead to asphyxiation, a fire or even an explosion. Since compressed gas cylinders are frequently used in many laboratories, employees need to be familiar with the precautions that should be taken when dealing with them. Areas covered in the course include the four ways to compress gases, hazards associated with compressed gases, proper storage procedures, marking and labeling, handling cylinders safely, connections and fittings, leak detection, and more. Using a powerful combination of audio, full-motion video, text and colorful graphics, this course provides the most cost-effective safety and regulatory compliance training available today. The course is divided into a number of logical sections so information is easily understood... and retained. Also designed with the training manager in mind, all courses in the Interactive CD-ROM Training Library include a learning management system (at no additional cost). Using this system, trainers can set up "Pre" and "Post" tests... establish log-in procedures... even define and set up curriculum for various job classes. The system also collects and organizes employee performance information through a powerful relational database, which can generate a number of record-keeping and tracking reports... and has a database "import/export" feature, which allows information to be transferred to and from an external database (such as a company's personnel database). The course is one of over 100 titles currently available in the Interactive CD-ROM Training Library.